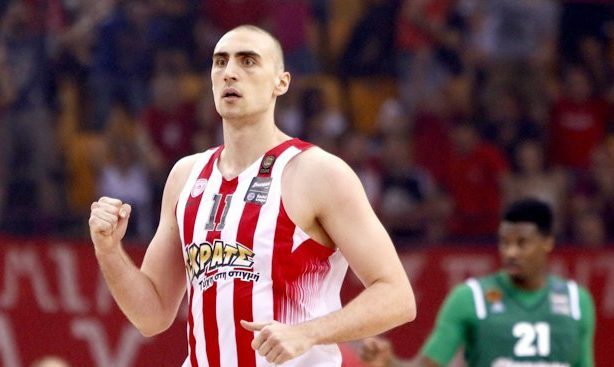 Serbian center Nikola Milutinov has signed a three-year extension with Olympiacos. Olympiacos officially announced that it has extended Nikola Milutinov with a new contract until 2020. The deal includes NBA buy-out clauses for summers 2018 and 2019. The San Antonio Spurs currently hold Milutinov’s NBA rights. “I’m really happy with the signing of my new contract. I feel great honor. Now I must work even harder to improve my game and justify the trust of Olympiacos“, Milutinov said on the club’s website. After spending 2015-2016 and the first part of the previous season as the third option off the bench in the frontline rotation of Olympiacos, Milutinov improved significantly enough to evolve into a primary character for the Reds’ game. The 22-year-old Serbian center had one of his best EuroLeague games vs Real Madrid (18 points, 4 rebounds) under the gaze of Spurs GM R.C. Buford and was the top performer (11 points, 7 rebounds, 2 assists, 2 blocks, 20 PIR) of Olympiacos in the win vs Anadolu Efes in Game 1 of the playoffs. The upcoming season will be Milutinov’s third in the jersey of Olympiacos and, judging by the preparation games, he’s expected to assume an even more important role on the floor for his team.